Yesterday I read an article that astonished me and I just had to share it with all of you. It is entitled “Young Adults Feel Empowered by Debt” and it talks about a new wave of young adults that “actually feel empowered by their credit card and education debts.” This is garnered from a study done by the journal of “Social Science Research”. This article shocked me because I have always been petrified of debt. In fact, part of the reason I went to University of Phoenix for my graduate school was I knew I could work while I studied; thus, allowing me to pay for most of my schooling and living expenses concurrent with my education. I was lucky to have some family support but even if it had been solely left to me I would not have gone into very much debt because I was working at the same time. I have also never bought property or driven a new car mostly because I am scared to death of being held down by the obligation of debt. People tell me all the time that I’m ‘throwing money away on rent’ but at least it isn’t a noose around my neck that could hang me if things go badly (both personally or with the economy at large). I have known so many people saddled with mortgages they can’t get rid of from homes that will not sell. In admitting my reservations about debt I also admit that in some ways it is a weakness. I know there are risks and investments worth taking, but I cautiously chose not to. I also gratefully acknowledge the many blessings I’ve had along the way which have helped me avoid debt. That said- I can’t imagine someone having the attitude of some in this article or the study at large. “Young adults wear their debt like a new tattoo”. I can’t imagine being proud of or feeling empowered by debt. To me it is a bizarre reaction. Another good article on the topic says that credit card debt is particularly tempting for young adults (considered in this study to be 18-35, so I still count!) because it allows them, if only temporarily, to experience a more exciting, full life. I think there is an attractiveness to credit card debt because it solves problems quickly. Want to look more professional, charge it. Want to take a memorable trip, charge it. The problem comes when all of that charging piles up. Unfortunately, Eichacker’s habit of using credit to finance his aspirational lifestyle later spiraled out of control when he opened his own business and used business and personal credit cards to purchase what he needed. “When the business foundered, I had to declare bankruptcy,” says Eichacker. He now receives collection calls almost daily and his personal relationships have suffered as a result of his wrecked credit history. I know that certain debt is unavoidable but shouldn’t it be looked at as a necessary evil, not an empowering gift? A large reason we are in such a financial mess as a country is too many people were “using credit to finance his [or her] aspirational lifestyle”. People aspired to bigger homes than they could afford, impractical degrees they will not see much value from, new cars they don’t need and wardrobes that they couldn’t pay for. As Eichacker experienced, I fear many will find what empowers them one minute, robs them of future minutes. I personally think part of the fault lies with our government. Have not many in Washington made the case for empowering debt? That spending when we have no money ‘stimulates’ the economy; thereby, making things better and making the obligation of more debt a good thing? Is this not another way of saying debt empowers the economy? Indeed, many are making such an argument right now in the debt ceiling debate. If it is so great for our nation than why not incur tons of debt in our individual lives as well? The truth is it that it is bad for our country and it is bad for individuals. Think I’m exaggerating? Take a look at http://www.usdebtclock.org/. Also, look at the interest owed of over 3 trillion dollars and growing! Think of all the good we could do with that 3 trillion if we weren’t in debt. I don’t think anyone should feel empowered by debt. Yes, it is a necessary evil for some but it is not a free check to pay later on. It carries with it many burdens and problems which must be fully anticipated before the debt is incurred. What do you all think? Are you empowered by debt? the article you’re referencing had a prominent qualifier that i guess most people didn’t think about. the inverse relationship between the student’s economic background and the supposed empowerment from the debt. when you put it in that perspective, it makes perfect sense for these students to feel empowered by the borrowed money. it allows them to go to school, to buy a car, to possibly get an apartment, to provide for themselves in ways that their parents never could. of course they feel empowered, because at that moment, the money is not debt, it’s the “big break” they had to wait 18 years to get. sure it may be a faulty presumption, but when you’re really thinking about who these people are, and the lives they led up to that point, it should be blatantly obvious why $20,000 out of the sky would feel good. even if it’s a deal with the devil, these kids spent their whole lives trying to live on the margins of society, and now they don’t have to. it’s a ridiculously understandable reaction. That’s true. Very well said. I guess I hadn’t thought of it in quite that way. I have in many ways been very fortunate with my financial upbringing and not felt the wants that true poverty provokes. I don’t think I’m spoiled or pampered but I certainly have not been poor. Nevertheless, I’ve always been completely scared of debt. You think people that have to worry a great deal about money would be more scared about debt but it seems to be the reverse? The feelings in the article were just so different than my own that I found them shocking but you are right “it should be blatantly obvious why $20,000 out of the sky would feel good” to someone who is truly in need. Perhaps creditors particularly prey on such lower income young people?- they know it will mean so much to them and that they do not have the financial knowledge to pay them back quickly. It is a near guaranteed long-term customer. Thanks for the comment. no problem. i just felt i had to contribute to the discussion since there didn’t seem to be anyone who saw this topic in that light. it was astounding to me that no one noticed something that seemed so clear to me–but then again, i would be in that group if i hadn’t been raised by the most frugal mom in the world… 🙂 even though i understand the dark underbelly of debt, where i come from, $200 sounds like a lot of money to me. the thought of someone just GIVING me $5000, for ANY purpose, is definitely appetizing. any student from lower middle class and below would typically make an easy sell for creditors. I’m glad you did. Thanks! I always look at my blog posts as part of my thought processes not the finished conclusions. I look at them as discussion points that I can learn from. You are absolutely right when you look at it from the perspective of low income individuals it would be empowering. Perhaps this makes the practices of the lenders all the more sinister? Preying on the emotions of those most vulnerable. Just saw this amazing Nova episode about the power of money. They have found that the brain does not behave in rational ways when under the power of money. They even have an experiment where people pay $28 for a $20 bill. I certainly love money just like everyone else ($200 seems like a lot to me too!) but I have always had this fear of debt. I am honestly not sure where it came from. I don’t know if being the middle child made me hold on to anything that was mine extra tightly or if it is just my nature. My parents were pretty frugal but finances were not a large stressor as might be in a single mom household. I think it is just part of my innate desire to have control and plan my life. 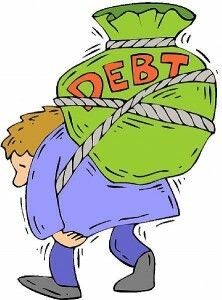 There is something about debt that feels out of control and in the hands of others. Like I said, it is not always a healthy fear- I take almost no risk with my money. I also think there is nothing wrong with taking out loans for school but I would look at it as a necessary evil. Its not like you are winning the lottery, which seemed to be the attitude of some in this article. However, as the article did say this reaction is typically an immediate visceral one and doesn’t last long. I also do think that our governments embrace of debt has made the appeal of debt all the more tempting. By the way, you were my 850th comment! Thanks again.